French botanist and artist Patrick Blanc is described as a rocks star of the botany world. He invented the modern concept of "the green wall." 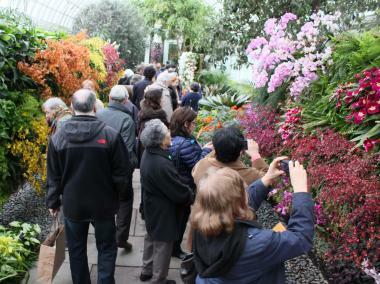 THE BRONX — At the 10th annual Orchid Show at the New York Botanical Garden, plants are not the only thing that's green. French botanist and artist Patrick Blanc with dyed green-hair will showcase thousands of flowers and foliage through a series of living vertical gardens from March 3 to April 22. 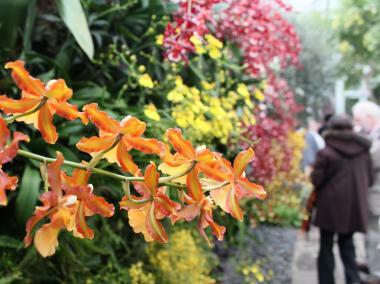 The show will also incorporate numerous orchid galleries, tours and talks, such as floral arrangements and care of orchids. Hachadourian worked with Blanc to create the series of vertical gardens that do not require soil. Instead plants grasp nonbiodegradable felt and natural moss and are supported with a metal frame. Blanc, 58, has created dozens of vertical gardens all over the world for private and public displays, including the entire facade of the Quai Branly Museum in Paris. “He is a bit of a rock star of botany,” said Hachadourian, as fans and reporters mobbed the designer. 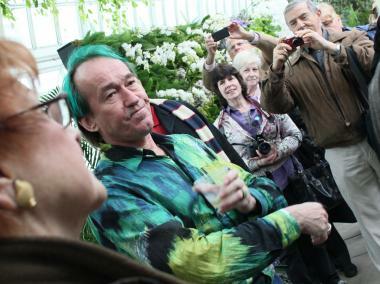 At a Friday Orchid Show preview, Blanc was ushered through the crowd sporting green hair, a green shirt and green shoes while carrying a glass of white wine that was topped up whenever empty. “This I found by a fast flowing stream in Mexico,” said Blanc in a heavy French accent as he knelt next to some purple-leaved foliage attached to a vertical garden. On another wall it was an orchid from the forests of India or green leaves from the slopes of Montana. The exhibition hinted at the places Blanc had traveled to locate plants under waterfalls, in caves and on rocks. “I wanted to create a gate to another place,” he said, while pointing to a huge orchid-covered arch. With more then 21,000 accepted species, the orchid is one of the largest families of flowering plants and has been found in a range of climates from the tropics of Asia, to North America and even within the Arctic Circle. Orchards hand from a wall at New York Botanical Garden's Orchid Show. The show, which took three weeks to construct, brings together orchids from dozens of countries including, Brazil, Thailand and Borneo. For Kelsey Graham, a 90-year-old member of the Botanical Gardens, this was his seventh orchid show and the vertical gardens of flowers blew him away. “Its beautiful. The color,” he said, standing next to a bright purple “Rainbow” orchid.